The Henry C. Gardiner Scholarship is designed to identify the brightest minds at Kansas State University with the greatest potential to make a difference in the future of the beef industry, and provide financial assistance in support of their education. 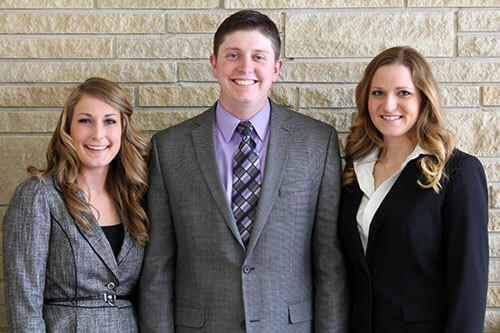 Three outstanding students have been awarded Henry C. Gardiner Scholarships for the 2014-2015 school year at K-State. Brady Jensen, Courtland, Kan., was raised in a respected registered Hereford seedstock operation. He currently is an officer on the board of the National Junior Hereford Association. Jensen is also a member of the K-State Livestock Judging Team, is a 4.0 GPA student and plans to pursue a master's degree in beef cattle genetics and eventually return to his family's seedstock operation. Esther McCabe, Elk City, Kan., has been involved in the Angus breed through her family's registered seedstock operation and her involvement in the National Junior Angus Association. Esther recently concluded her year long commitment as Miss American Angus, the official national ambassador for the American Angus Association. Her future plans are to continue post-graduate studies in animal breeding or genetics. Esther is a 4.0 GPA student and also plans to teach at the university level. Lindsay Upperman, Chambersburg, Pa., has been honing her livestock judging skills since the age of five and is currently a member of the K-State Livestock Judging Team. In addition, she is vice president of the Collegiate Cattlewomen and serves on the board of the National Junior Angus Association. Lindsay will complete a summer internship with Dr. Dan Thomson, Jones Professor of Production Medicine and Epidemiology, for STEC-STEP Cap Program implementing E. coli research. Lindsay plans to continue her education post graduation with the ultimate goal of obtaining a doctorate and applying her education through research. "These students have every opportunity to confirm what we all hope to be a reality in the future of production agriculture. They are bright, ambitious and have plans to make the beef industry better," said Mark Gardiner. "Henry Gardiner's curiosity and continual search to make genetic improvement through better science, technology and education serves as a role model for these students. We are certain Brady, Esther and Lindsay, through their educational endeavors and personal commitments, will continue Henry's legacy." The Henry C. Gardiner Scholarship is possible through the generous contributions of Gardiner customers, friends and family in an effort to continue the legacy of Henry Gardiner. Students classified as a rising-junior, junior or senior, either enrolled in or planning to enroll at Kansas State University with a major in Animal Science & Industry or closely related field may apply. Scholarships are awarded annually to students meeting rigorous criteria and exhibiting a passion to focus on improving the beef industry. Gardiner Angus Ranch is a family-owned and operated business that produces registered and commercial Angus cattle. The original ranch was homesteaded near Ashland, Kan., in 1885 by Henry Gardiner's grandfather. The ranch encompasses more than 46,000 acres. The Gardiner operation sells approximately 2,000 bulls and 1,500 registered and commercial females a year. Over 80% of the sale offering each year is the result of embryo transfer. Gardiner Angus Ranch is a founding member of U.S. Premium Beef, the producer-owned limited liability corporation with minority ownership in National Beef, the nation's fourth largest beef processing company. By providing access to a proven, value-added processing system through GAR delivery rights, Gardiner Angus Ranch customers have received more than $5 million in premiums and dividends.